How to Run Maven Based Projects on a Remote Raspberry Pi Using NetBeans Part 2 of 2. Ken Fogel July 17, 2016 July 17, 2016 No Comments on How to Run Maven Based Projects on a Remote Raspberry Pi Using NetBeans Part 2 of 2. In the first part of this series I presented a solution for developing on a Windows PC a Maven managed Java applications with NetBeans and then deploying it to a Raspberry Pi. In this part I will look at at a solution that allows you to accomplish these tasks from within NetBeans. It will work with any version of Windows and Linux. For this solution you will need an additional program on your Windows PC. You need a program that will allow you to interact with a Raspberry Pi or any Linux system from the command line in Windows. This is necessary because we will write a script that will carry out the required tasks. 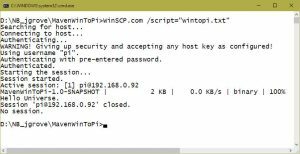 For this solution I have chosen WinSCP as my tool for connecting to the Pi, uploading a file or files and then executing the file. It is not the only solution but its ability to run a script when executed makes it an ideal choice. You can find WinSCP at https://winscp.net/eng/index.php . Here is a direct link to the download: https://winscp.net/download/winscp577setup.exe . Once installed you should add its location to the System PATH so that it can be run easily from the command line. Test it with a script. Here is a script from for my MavenWinToPi project from the previous article. Save the script as wintopi.txt in the root folder of the MavenWinToPi project. Copy the jar file from the PC to your home directory on the Pi. You can place it any folder by adding a path at the end of the put command. Execute command line java to run the jar file you copied. If you are using a directory other than home, then you will have to include the full directory path to the jar file. There are two programs named WinSCP that are installed. One is WinSCP.exe that produces a GUI display similar to Filezilla. You could use WinSCP in place of Filezilla in solution #1. 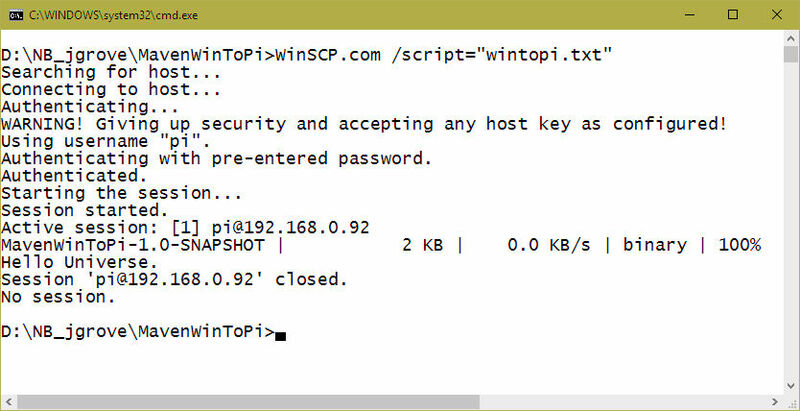 The other is WinSCP.com that is the command line version and is the one we want to use. If it fails because WinSCP.com cannot be found, then use its location in the command such as it is on my system. If you can see “Hello Universe.” You know it has worked. Don’t panic over the WARNING! message. It is a result of using a wildcard for the -hotkey switch. Once you decide to go production you should carefully examine security. Now its time to make Maven execute WinSCP.com and the script. To have Maven execute WinSCP and its script we need to add to the pom.xml file. Here is the original pom.xml as generated by NetBeans. The Maven exec plugin is usually used to indicate which class contains the main method and or to add switches or arguments to the execution of a Java program. In my example I am using the plugin’s additional capability to run any type of executable. In this case the executable is WinSCP.com and the argument points to the script. To carry this out the command must be associated with a specific phase. In this case it is the ‘install’ phase when the fully assembled jar file is stored in the local maven repository. You know that all is well because you can see the ‘Hello Universe.’ Message. The technique described her in part 2 will only work for applications that only have console output. If you must interact with the program in the console or if the program has a GUI then you will have to use solution #1. In the remaining articles in my IoT without the Breadboard series I will be using this technique. If you know a better way to accomplish this, then let me know about it and I will update this information. I’d like to thank fellow NetBeans Dream Team member Johannes Weigend for pointing out that the maven exec plugin could be a solution. How to Run Maven Based Projects on a Remote Raspberry Pi Using NetBeans Part 1 of 2.